Starting this week in the Klang Valley, the Apple iPhone 3GS will be offered at selected Brightstar Malaysia dealers at the special price of RM1090. It will be available via a couple hundred authorised dealers nationwide next week. 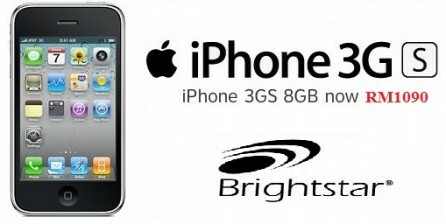 The iPhone 3GS from Brightstar Malaysia is upgradable to the latest iOS6 that was introduced last month with 200 new features. The iPhone 3GS, introduced in 2009 was made available in July via the mobile operators in Malaysia. Despite its been 3 years now, the iPhone 3Gs is still being sold with contract via Maxis and the 8GB version remains one of their top selling iPhone models. The Apple Store Malaysia also offers the device without contract at a slightly higher price at RM1199. For more info contact Brightstar at 1300 88 2744.